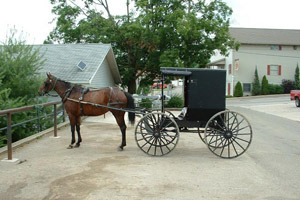 The vast majority of Amish-owned businesses do not have a web presence. We have compiled a listing of the Amish-owned businesses and stores near the Berlin, Ohio area for reference and will continue adding more as we receive information on them. All Amish businesses are closed on Sunday, and often on Thursdays, because Thursdays are usually their wedding days. 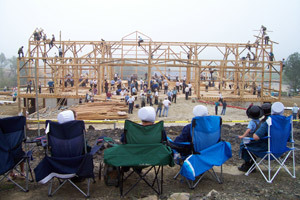 For all other non-Amish attractions and businesses, visit our Explore page. P O Box 955, Dept BG, Greenville, OH 45331, selling traditional & contemporary clothing for dress, work, garden & farm, traditional dolls, Amish crib quilt, head coverings, catalog $1.00. 4500 SR 557, Millersburg, OH 44654, 330-893-9899 Specializing in quilt fabrics, with more than 8,000 bolts of fabric in stock. 8114 St. Rt. 241, Mt. Hope, Ohio 44660, located at the intersection of CR77 & 241, carry a large selection of fabrics for the Amish and plain people, quilt battings and gifts, 330-674-5292. 2447 US 62, Winesburg, OH 44690, Mailing address is 7181 TR 665, Dundee, OH 44624; Name brand closeout foods, Case Lots, paper products, Truck loads of items such as barn siding, tools, sporting good, other construction items. Chicken raised outdoors on pasture fed non-GMO feed, Turkey, Duck, Goose, Guinea, Rabbit and more. Open Mon, Fri. 7:00am to 5:00pm. Sat. 8:0am to 12:00 noon. Address:3160 Pleasant Valley Rd SW, Baltic, OH 43804. Phone (330-897-0626). Call for a free brochure and prices. 6197 Township Rd. 605, Millersburg, OH. - 330-674-1283 Ext. 2. Specialising in local organically grown grains including: Spelt, Wheat, Oats, Rye, Corn, Granola, and Bars. Hours 7am. - 4pm. 8439 TR 527, Shreve, OH, 330-567-2569Weaver Ridge Surplus, 2495 CR 168, Dundee, OH, near Trail, Carry name brand bent & dent groceries, paper products, and more. 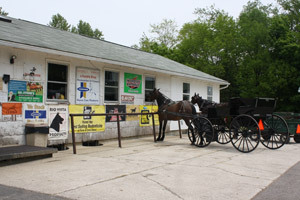 7508 Honeytown Rd, Fredericksburg, OH 44627, 330-695-5312, Butchering of beef, hogs, and deer. Make Summer Sausage, Bologna, Wieners, Kielbasa, and Snack Sticks; offer curing and smoking; open seasonally. John M. Yoder, owner. 2696 South Carr Rd-94A, Apple Creek, OH 44606; manufacture and sell superb mattress sets; purchaser must order in advance and pick up, no delivery. Hours: Mon, Tues. 8-5. Wed, Fri. 8-7. Sat. 8-3. Closed on Sundays and Thurs. (Wholesale Sales Only) 8977 Twp Rd 652, Fredericksburg, OH 44627, Fax. 330-698-3200, dining room tables from the traditional to unusual. 1009 S. Carr Rd, Orrville, OH 44667, Fax 330-698-3200, Manufacture of quality hardwood kitchen and dining chairs, benches, and stools. New location, new showroom, located on US 62 between Berlin and Winesburg, 330-893-4322, Paul & Mabel Miller & Leroy & Marie Keim; hours Mon-Sat 9-5. 13070 Nisley Rd., Fredericksburg, OH 44627, owned by Raymond Troyer & Family, specialize in the manufactur of quality cedar chests. 11463 Harrison Rd, Apple Creek, OH 44606, 330-695-2249 ext. 1, Mon 9 to 7, Tues-Sat 9 to 5. 5044 CR 120, Millersburg, OH, voice mail 330-893-3261, Renewable energy dealer, expanded inventory of assorted solar panels, batteries, wire & inverters in stock. Save 20%-50% off. 3939 CR 135 between Berlin and Walnut Creek, 330-893-3866; authorized Zereba repair center; carry solar fences, modified hand crank Bosch mixers and accessories, Hrs Mon-Thur 7-5, Fri 7-4, Sat 8-12. 8194 E. Moreland Rd., Fredericksburg, owner Paul Hilty, installs windows, siding, & doors, custom made to fit; window & screen repair. 800-213-2012 voice mail. 10215 Harrison Road, Apple Creek, OH,330-464-5579, Custom builders of maintance-free cupolas in many different sizes, colors, and options. 50940 TR 220, Rt. 1, Baltic, OH, off St Rt 643, carry porch & floor enamel, interior & exterior latex & oil paints, truck & tractor enamel primer, ice cream freezers, and bulk foods. Located 2 1/2 miles SW of New Bedford. Mon, Tue, Thurs, Sat 7:30-5; Wed & Fri 7:30 - 8. 11461 Saltcreek Rd, Fredericksburg, OH 44627, stock bundles and truckload quanties of rebar; Structural: angle, flats, channels, beams, pipe; Expanded Metal: Square, tube, stainless steels and many more. Advertises competitive pricing. Owner Aden A. Troyer; hours Mon-Fri 7 - 4:30. 5840 Co Rd 201, Millersburg, OH 44654, 877-536-2276, Maker of garden, tool, utility, and storage barns, also garages and cabins in an extensive line of styles, colors, and options. 1954 Twp Rd. 661, Winesburg, OH 44624, Carry gas home refrigerators, EZ Freeze brand, electric fence supplies, paint, and more. Hrs: Mon - Fri 7-5; Sat 7:30 - 12; 330-359-5952, accept Disc, Visa, MC. 5044 CR 120, Millersburg, OH 44654 330-893-3261; Solar and wind sales & service, set up available, 25 year warranty; Mon-Fri 7 a.m .- 5 p.m.; Sat 7 a.m. - 4 p.m.
1855 Co Rd 140, Sugarcreek, OH 44681, Mon-Fri 7 to 4:30, Voice Mail 330-852-0205, Build custom steel and fiberglass entry doors. 7655 SR 241, Millersburg, OH 44654, source for wood-burning cook stoves and heating stoves. See them for the highest quality & lowest prices on wood stoves & inserts. Foundation Repairs, Footers, Backfills, Drainage, Gas, Water, Sewer Lines & Water Proofing. Henry Miller, Address: 8145 TR 528, Shreve, OH 44676. Phone (330-231-0117) Fax (330-567-0029). 330-857-2430 - 16614 Jericho Road, Dalton - Custom Faricated Railing - Wrought Iron, Aluminum, Stainless Steel, Residential, Commercial, Interior/Exterior, Installation, Painted or Powder coated finishes. Vegetables, heirloom tomatoes, goji berries, hanging baskets, 100+ varieties of herb plants, mint plants, and seed savers exchange seeds, 8128 Maurer Rd. Apple Creek, OH, 44606. Hrs: Mon.-Sat. 8-5. Hanging baskets, bedding plants, and vegetables: 2998 CR 200, Dundee, OH 44624, Tel: 330-359-5195. 4319 CR 168, Millersburg; 330-893-2421; offering power mowers, Kipor inverter generators, yard maintance equipment. Homegrown asparagus and rhubarb, hanging baskets, geraniums, gerbera daisies, lots of 4-4 1/2 pots, bananas, grapes, oranges, apples, grapefruit, lemons, kiwi, and pineapples. Homegrown fresh lettuces, bunching onions and strawberries coming soon! 2 miles south of Mt. Eaton, 10548 Massillon Rd. (Off of CR 241) Hours: Mon, Tues, Wed, Fri 9am - 7pm, Thurs & Sat 9am - 5pm. 4741 SR 557, Millersburg, OH 44654, 330-893-3033, Hrs: M&W 7-6, Tu. & Th. & F 7-5, Sat 7:30-11:30, carry Snapper, Stihl, Yamaha, Troy-Bilt, Toro, eXmark. 2447 TR 183, Baltic; 330-897-7603; Fax: 330-897-1273; Sales and installation of any type of fence made to order. You install or they install; Vinyl fences, railings, decorative fence post caps, Vinyl rods, electric fence & chargers; automatic gates, retail & wholesale. They also carry a full line of fence supplies; woven wire, barb, chain link, split rail, porch railings, sand boxes, hot beds, arbors, picnic tables, dog kennels, and more. Hanging baskets, annuals, vegetables plants, and garden seeds. 5100 Fredricksburg Rd. Wooster, OH 44691. Hours: Mon-Fri 8:30-7:30; Sat 8:30-4:00; Closed Sunday. 15709 Jericho Rd., Dalton, OH, 44618, 330-857-0360, market The Egg Saver Rollaway Nest for up to 25 chickens, eggs roll to the front and stay clean. manufacture of horse-drawn equipment; riding plows, foot-lift sulky plows, motorized forecarts, wagons, and more; Leon Wengerd, 16875 Jerico Rd., Dalton, OH 44618; Send for a catalog, voicemail 330-857-6340. 8691 TR 561, Holmesville, OH 44633, Telephone 330-279-2345, Fax 330-279-2090. This company manufactures ice house kits for storage of ice harvested from winter ponds, ice boxes, portable ice houses, and chests. Contact them for a free information packet. 3998 CR 168, Millersburg, OH 44654; 330-473-7727; custom welding specializing in aluminum truck beds and tool boxes; rubber tire manure scrapers, and custom built backyard fire pits. 4540 US 62, Millersburg, OH 44654, 330-893-3149, Hrs: Mon-Sat. 8-5, Patio Furniture, gazebos, Log Cabins, Gym Sets, Storage Barns, Bird Houses, Feeders, Arbors, Bridges. 10258 S. Kansas Road, Fredricksburg, OH 44627, 330-231-5034, Hours: Monday 10-8: Tuesday-Friday 8-5: Saturday 8-4. Tools - Housewares - Furniture - Sporting Goods & Lots More. Take the scenic route, you never know what you'll find! 4663 US 62, Berlin, OH, 330-893-3890. 3087 TWP Rd 161, Sugarcreek 44681 Mrs. Ada Troyer is continuing the broom business left by her deceased husband who was blind. She also sells German and English Books as well as cleaning products. Her shop is about three miles south of Rt. 39. 33897 SR 643, Baltic, OH 43804, providing leather goods; Red Wing, Justin, Irish Setter, Skechers, Hi-Tec, Muck & More, 330-897-1421. Mon - Thurs 7-5:30; Fri 7-8; Sat 7-4. 6928 CR 77, Millersburg, OH 44654, 330-893-4151, Weekdays 7-5, Saturday 7-11:30 a.m.
Mary Yoder, P. O. Box 32, Mt. Hope, OH 44660; GPS Address: 7700 CR 77, Millersburg, OH 44654; Mon - Thurs 7:30 a.m. - 5 p.m.; Fri 7:30 a.m. - 7 p.m.; Sat 7:30 a.m. - 4 p.m.; boots and shoes for the family, hunting and sporting goods. 6009 Twp. Rd. 419, Millersburg, OH 44654, voice mail 330-893-1024. This is an incredible shop that carries a vast selection of quality harnesses, collars, hames, supplies for show horses, horse grooming and care supplies, you name it. They carry a catalog of products. 3270 Cty Rd. 114, Sugarcreek, 330-893-4519. Handcrafted brooms. Hours: Mon. 8-7 Tues-Fri. 8-4:30 Sat. 8-3. 5425 CR 77, Millersburg, OH 44654, Phone 330-893-3785; Fax 330-893-4103; Selling canning supplies, pressure cookers, strainers and much more. 1951 CR 70, Sugarcreek, OH 44681, 330-852-2666; Sell solid flat free Wheels; Solid tires outlast air tires 3 to 1; Various size wheels for wagons, wheelbarrows, lawn carts, pony carts. 330-893-3866; off-grid solar and wind power systems; solar and batter water-pumping systems; natural gas generator setup; solar panels. 17 years of pump service experience. 5218 SR 515, Millersburg, OH 44654 Ph. 330-893-0151 The place to go for custom canvas covers & vinyl products. 3062 CR 160, Millersburg, OH 44654, 330-359-1501. Selling small pony carts with #2 wheels and offering options such as cage, dash fenders, 2-way lights, also harnesses for small ponies. All harnesses are made with Biothane.Tack, harnesses, saddles, Ez-Entry carts; wooden cart wheels and heavy duty metal/rubber wheels. Call for a catalog. 5000 Fountain Nook Rd, Apple Creek, OH 44606. Hours Mon-Fri 7 a.m.-5 p.m., Sat 7 a.m.-11 a.m. Manufacture the Amish Dress Hat (Black Only). Black felt hats, some seconds available in felt hats, straw hats - lots of different styles and shapes, black plastic hat covers, hat brushes, eye glass frames - rimless, plastic, and many other choices in black, brown, silver, gold, gun metal, among others and NEW! Hat stretcher. 10225 Senff Rd., Dundee, OH 44614; 330-359-5126; Specializing in engines, parts, & service; Diesels 6 to 500 H.P. 4663 US 62, Berlin, OH, Phone 330-893-3890, Mon-Fri 9 to 5, Sat 9 to 3, Amish resale store. 6954 CR 77, Millersburg, OH 44654, 330-674-0210 or 866-308-0727, Fax: 330-674-0920, Hrs: M-W 7:30-5, F 7:30-7, Sat 7:30-3; Clock sales & repair, binoculars. 3401 TR 411, Dundee, OH 44624 This business sells Pioneer, horse drawn farming equipment, the Pioneer riding plow and New White Horse riding plow. Voice mail 330-893-3086. 7802 Salt Creek Rd., Fredericksburg, OH 44627; 330-695-5593, Mon-Sat 8-5 p.m.; Large "Amish" store in the country; Stainless steel cookware, glassware, china, kitchen items, children's toys, and most things that an Amish woman might need. 8900 Twp Rd. 652, Fredericksburg, OH 44627. This business offers a complete line of horseshoeing equipment. Carry 100's of anvils, forges, and shoeing boxes in stock; over 300 styles and sizes of horseshoes; hoof care products, minerals, write them for a complimentary catalog.